and some pretty decent looking cocktails being served - but don't be waylaid, continue on into Shrimpy's and you enter a rather lovely space, crisp white table linen and top-end silver and glassware contrast with the graffiti-esque wall and the fact you are sitting in a converted petrol station. The other half and I started with an off-menu whisky sour and it was by far and away the best we have had (and believe me, we've had a few...). 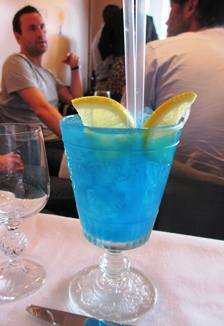 Ben & Gen had suitably colourful drinks (as you can see) that they also said were delicious. My starter of seabass ceviche with crispy plantains was fresh, zingy and spot on. 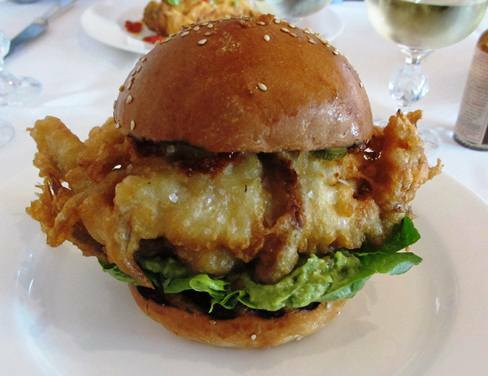 For main course there was only one option for me, after having read so much about it I was always going to have the soft-shell crab burger and it did not disappoint. Even though the other half was gagging at me chowing down on an intact crab (albeit battered) I tucked in with relish and absolutely loved every mouthful. I also had some humita on the side - which I had never heard of and was sort of like posh creamed corn, but way more delicious. My companions also loved their sweetcorn chowder and fried chicken so all in all some very happy diners.